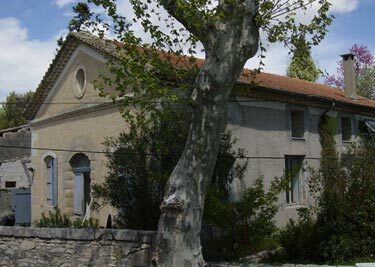 The first picture shows the old Meeting house and burial grounds in the Languedoc village of Congénies, 20 km from Nimes and Montpelier in the south of France. Originally built in 1822, it became a hospital and a private house in the 20th century before its recent re-conversion. Congénies was home in the eighteenth century to a group of independent thinkers called “les inspirés” (the inspired ones) who after a visit to Quakers in London, founded the first Quaker meeting in France. Non-conformism was the majority religion in the villages around Nimes at that time. From the early nineteenth century the meeting grew and flourished. At the time of mass conscription in France some sixty years later, a decline set in as all the young men emigrated. In 1907 the Meeting House was sold and was subsequently used for many purposes over the next fifty years, including a hospital and a school and finally a private house. Now it is being re-developed as a Quaker international centre but serving the local community as well. A pacifist community called locally "les Couflaïres" (The inspired ones) existed from early in the 17th century in Congénies and villages nearby. They raised sheep and silkworms and made woolen and silk stockings in the Vaunage, a sunny and fertile valley between Nîmes and Montepellier, which they called "little Canaan". During the American revolution of 1775-1783 the British monarchy encouraged British ships to attack any French vessels they could find because France was supporting the colonists. One British Quaker, Joseph Fox (no relation to George Fox) co-owned three ships and unbeknownst to him his co-owners were gainfully attacking and raiding French ships on the Atlantic. When he realised this state of affairs, Fox was appalled and in 1785 he took out a paid advertisement in the Gazette de France in which he categorically stated that Quakers did not indulge in piracy. He detailed the faith and practice of the Religious Society of Friends and offered to compensate all victims of his three ships, inviting people to write to him to state their claims. The Gazette de France was read in Congénies, and 5 of the "inspired ones" wrote a letter to Fox explaining that they were not claiming any booty but they were impressed by Quakers ideas, which they fully shared, and would like to meet him. 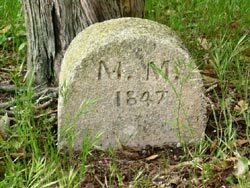 They sent Jean de Marsillac to visit Friends in London and in 1788 founded the first Quaker meeting in France. The Meeting House was built in 1822 with the help of funds supplied by both American and English Friends. The Meeting, which through the 19th century numbered some 200 large families over a wide area, died out following emigration of the pacifist young men to avoid compulsory military service. The last Meeting for Worship held in 1905, the Meeting house was sold in 1907. It served a wide variety of purposes during the early 20th century before it was renamed Villa Quaker and converted into a private residence by Quakers who retired from the British Consulate in Marseille. Having been sold on twice, each time to Quakers, it was bought by France Yearly Meeting in 2003. The Maison Quaker reopened its doors in 2004 for meetings for worship, retreats, workshops and discussion groups. From its rural base two centuries ago, the movement has developed with a more international base, becoming more active in service and peace work. 1919: Paris International Centre set up with visiting Friends from the UK and the US -- numbers grew slowly. 1933: France became an independent Yearly Meeting. Local Friends joined with Quakers in Germany to distribute money to German refugees. 1937: French Friends responded to a call to help Spanish children -- a refugee camp in Barcelona was supported totally by Friends. 1939-1945: Along with Friends in Paris, Quakers around France aided Jewish refugees; as pacifists they took non-combative roles such as nursing, cooking and stretcher-bearing. The German commandant asked them to help at the the prison in Bordeaux. Gilbert le Sage was later given the Medaille de Justice by Israel for saving Jews, particularly children, during the war. Today, Quakers in France are active towards a climate of non-violence and campaigning against the arms trade. 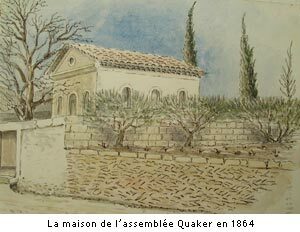 To find out more about Quakers in France, visit the web site of the Centre Quaker de Paris.